Was Google too hasty with the Farmer Update? If you're on the loosing side of this update, I think you would agree Google hastily pushed out this update to appease those commentators/media pundits that have continually complained about the quality of the SERPs. If you on the winning side of the update, then this was a much needed update to wash the search index of the voluminous spam and low quality content websites that has taken over in recent years. A recent Discussion of the Week thread on Sphinn started off asking how the Farmer Update should have worked. What did Google get right or wrong with this update? What would you do differently if you were Google? The discussion quickly turned to the timeliness of this update and it's got quite a few SEO questioning loudly whether this update was too reactionary. This is not the first time SEO's have complained about Google being to reactionary. How many major updates over the last few years has been in response to major problems in the index that have gone on for extended periods of time. Florida? Nofollow? MayDay? In my opinion instead of reacting to a negative situation in the index, Google should have seen this coming and more proactively handled these issues algorithmically. "Farmer," on the other hand, as a reaction to criticisms regarding the quality - as opposed to relevance - of sites appearing in the search results, has achieved the same sort of scale of collateral damage as "Florida" without actually hitting the mark. The update might have been rushed but as Jill Whalen points out that "whether the changes where planned already or not doesn't matter. 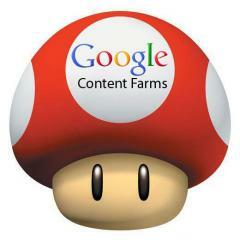 The fact that they're finally doing something about their organic SERPs is definitely good". I think we can agree to that. Continued forum discussion at Sphinn.